How much longer must I endure your incessant mooing? Cows – what gentle creatures they are. They give us milk, eat grass and hay, have four stomachs, and moo. Well, at least that’s the image city folk have. I dare you to drive down a country road, pass a cow pasture and not hang your head out the window and moo! You can’t help it. Cows just have that effect on us. It’s the image city people have of cows and country living. 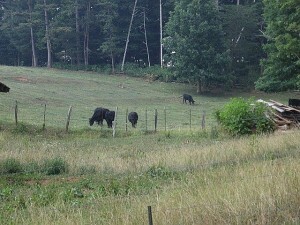 However, country folks have an entirely different relationship with cows. Picture if you will a bucolic pasture, the sun coming up over the hill and in the field across the road are twelve cows mooing . . . mooing . . . and MOOING, at 5am in the morning. Your sleep has been horribly interrupted. It’s now 6am and they are still mooing! By 7am, you’re sleep deprived, and screaming at this innocuous creature. You walk over to the fence in your slippers ranting and pointing your finger at their huge heads swearing you’ll make a leather wallet out of all of them if they don’t stop. It’s then you realize you are having a tyrannical argument with a cow! You’re so ashamed, but continue to brow beat the beast for waking you up… sad indeed. It’s now 9am, and the farmer has arrived. Thank God, they are finally being fed. You thank and curse the farmer as he doles out their morning ration of hay and cattle feed. Peace, quiet and tranquility at last. You sit on the porch enjoying your morning cup of coffee and your horses come over from the larger pasture neighing and snorting. The barn cats not far behind, screeching, and howling for their breakfast, a school bus ripping down the road back-fires! You’ve had enough excitement for the day. You decide go back to bed and dream of New York strip steak medium rare with a side order of baked potato with sour cream and chives. At least potatoes are quiet! Knock, knock. Who’s there? Interrupting cow . . . Interrpt . . . . MOOoooooo! Disclaimer: No cows were hurt, humiliated, made to feel inferior or responsible for my sleep deprivation during the creating and/or writing of this article. 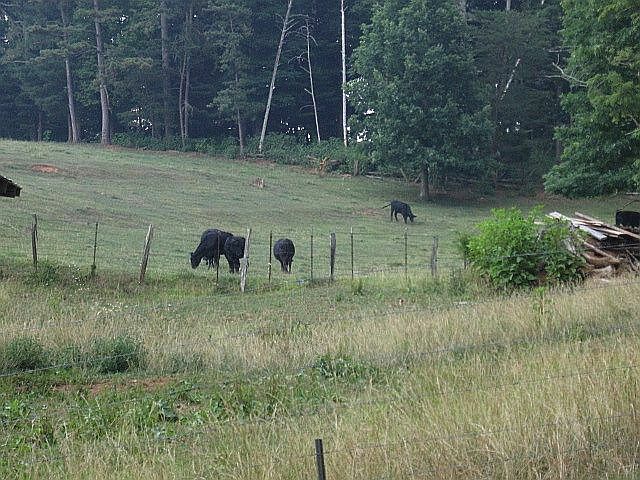 Said neighbor was not chastised for his tardiness in feeding said cows nor was his pointing and laughing at me ranting at said cows to be offensive in any way toward said writer. OMG that was hysterical! I’ve got that song stuck in my head!! HA HA HA! And then there’s the issue of being down wind wind from them after they’ve digested what they eat … if you know what I mean. If you can’t reason with them, roast them! How can you tell if the cows are mooing or just lowing? LOL! LOL yes my nicknames for them are Chuck and Roast! Donna we’d have lots baby birds chirping too. Sadly,their chirping is like a breakfast bell to the black snakes, LOL! But nothing makes my teeth grind like baby cows bawling for their mommas!! This actually sounds inviting to me Deb. I would much rather live out in the country than the suburbs. Bring on the Moos. I’d be more than happy to record them and send you a soundbyte, but I like you Matty. Wouldn’t do that to you, lol!